Amed dive sites include our house reef and Ghost Bay, providing top-class muck diving, with mimic octopus, ghost pipefish and more. 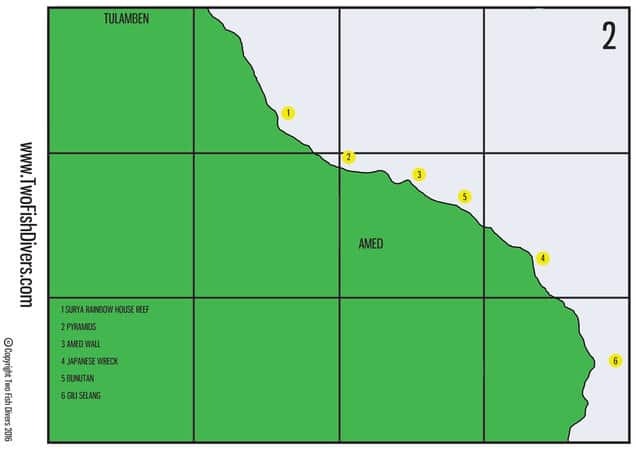 Amed Wall and Pyramids provide easy drift dives with turtles, reef sharks, blue-spotted stingrays and many reef fish. If you want wrecks then we are just 20 minutes from the famous USAT Liberty wreck, home to turtles, barracuda, lovely corals and great macro life, or visit Japanese Shipwreck for more macro and many gorgonians on a sloping reef. Very good muck dive with black sand, occasional rocks and mooring lines that offer some amazing macro life. We are still exploring and have already found many seahorses, frogfish, ghost pipefish, mantis shrimp, nudibranchs, pipefish, a variety of shrimp and other crustaceans, saddleback anemonefish, long horned cowfish and much more. A lot of this life is very well camouflaged but our experienced guides know how to find it – good news is none of it moves too fast so it’s amazing for photography. Dived from a Jukung (local outrigger boat), Pyramids gets its name from the artificially created reefs that the local dive community has built in that are in the shapes of pyramids. The structures attract all sorts of life like Snappers, Puffers, Ghost Pipefish, Nudibranchs and so on. 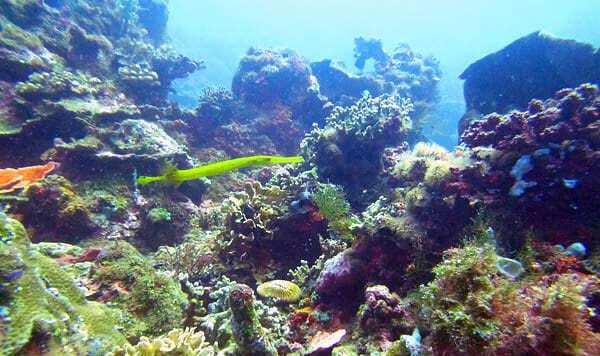 Besides the artificial reef the is also the natural reef where you can spot Stingrays, Garden Eels, Harlequin Sweet lips, Ribbon Eels and much more. This site is great for a drift and if the current is not to strong then it makes for great photography as well. Also a boat dive Amed Wall can be a good drift when the current picks up. Here there is a flat sloping reef that turns into a mini drop off where you have the chance of seeing Black Tip Reef Sharks, Big Groupers and the occasional Manta or Tuna. The Wreck lies in a calm bay and it sits in just 5m of water, It along with its surroundings make for an excellent muck dive with Pigmy Seahorses, Leaf Fish, Scorpion Fish and a handful of other critters. Great site for macro photography. 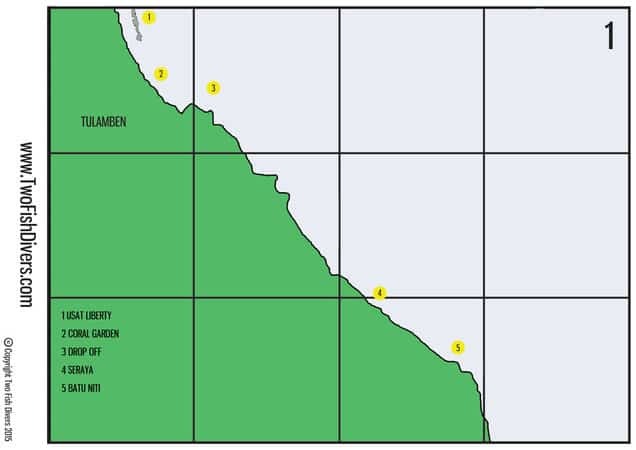 10 minutes from our centre lies the reef corner of Bunutan. Best dived as a drift we work out from a sandy slope to a corner with excellent fish life, especially from 20m down. Shoals of snapper and fusiliers hang out here while sharks and trevallies are often seen patrolling at the corner. After watching the show we work up the reef slope and finish in the protected shallows, where you’ll find huge barrel sponges and coral bommies adorned with gorgonian fans of many species and colours.  the right tide, as such they are suitable for experienced divers only. However they are the best place in the area to see large pelagics – big barracuda schools, reef sharks and tuna are common, with occasional dolphins, mola-mola and even hammerhead sharks if you are lucky, along with luscious hard and soft coral gardens. The famous Liberty is a shipwreck for any diver level from an Open water or a Discover scuba diver to an advanced diver who has hundreds of dives logged. Snappers, Groupers, Barracuda, and occasional visits from Black tip reef sharks are some of the bigger things at the wreck, if you are interested in macro the wreck has Ghost Pipefish, Nudibranchs, Leaf fish and tones of other little critters. With great coral colour and normally good visibility and light the Liberty makes for an excellent photography dive. We normally dive the Liberty first thing in the morning before the crowds arrive from Sanur and Kuta. The Coral Garden at Tulamben is a site that is bursting with life, yet another site that is great for photography. Scorpionfish, Ribbon Eels, colonies of anemones with their resident clown fish along with giant Bumphead Parrotfish and passing Blacktip Reef Sharks are a few of the things that you can see here. 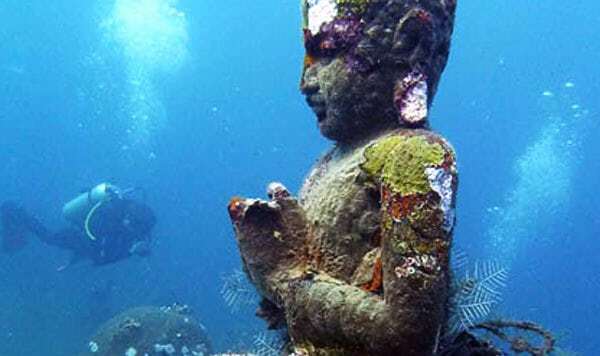 An artificial reef has also been created here which comprises of a mix of various Balinese statues all of which attract a lot of life to the reef and makes for a great photo opportunity with your buddy. The Drop off can be quite an exciting dive with Black-tip Reef Sharks, Groupers, Stingrays and other marine life. It makes for a great wall dive as well a bit of a drift depending on the currents. 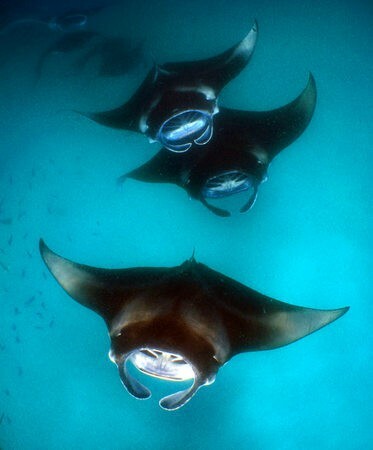 There is also a chance of seeing Mantas but these are just visitors who pass by now and then. A steep lava wall covered in corals leads down to a black sand slope at this site between Tulamben and Amed. Black coral and Barrel Sponges abound, with frogfish, nudibranchs, and other critters hiding amongst the reef. Keep an eye out in the blue though as large pelagics occasionally pass the point. Definitely one for the macro enthusiast or photographers this black sand slope has scatter patches of reef and sponge hiding superb macro life. Nudibranchs, multiple species of ghost pipefish, pygmy cuttlefish, frogfish, boxer crabs, seahorses… the list goes on and on. Black sand diving at it’s best. We can also offer day trips to Candidasa and Padang Bai, about one hour south of Amed by road, or boat trips to Nusa Lembongan and Nusa Penida, two large islands off the South East coast of Bali. 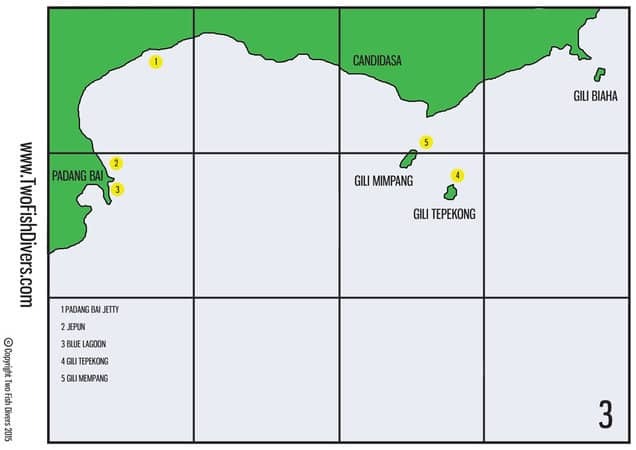 Just off the coast of Candidasa are the two little islands of Gili Tepekong and Gili Mimpang. Although the current can be challenging at times this water movement brings lots of food to the area… and food brings fish! So along with the strong currents you have a lot of sea life around these islands, such as white tip reef sharks, barracuda and turtles. Between July and October the Sunfish or Mola Mola is a frequent visitor. Padang Bai is a little sea side town on the eastern coast of Bali in the same area as Candidasa. 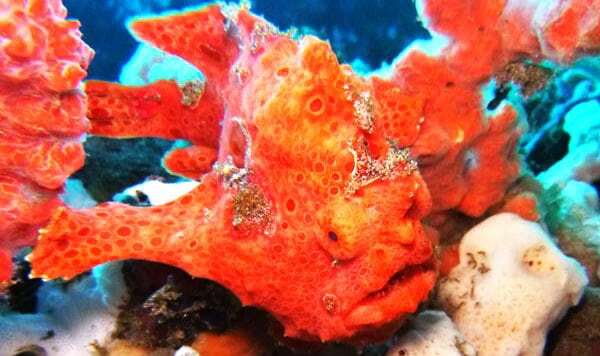 It is one of the most popular sites for muck diving in Bali with the Padang Bai Jetty being our favorite along with Jepun, you can spot a number of the resident Giant frog fish along with a number of different types on pipe fish, Pegasus sea moths and other critters. 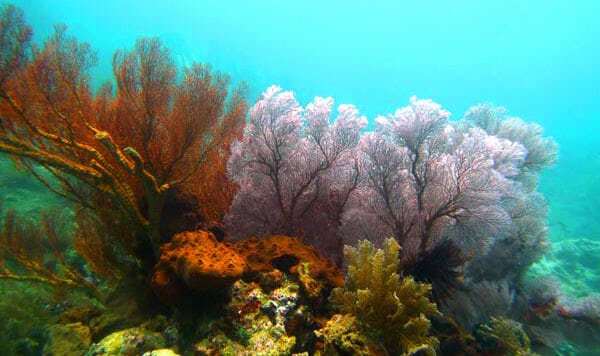 Other dive sites off Padang Bai offer some lovely muck dives along with a couple of reef dives as well. 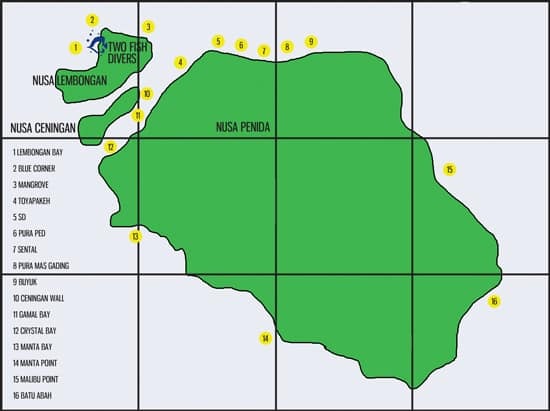 Day trips to Candidasa & Padang Bai are a 1 hour drive away from our dive center in Amed. After picking you up at your resort we leave the Dive center at 8:00am to get to Padang Bai or Candidasa where we take a jukung (local Balinese boat) to the dive sites. After the two dives we return to shore for lunch and then head back through the hills and rice paddies to Amed. Nusa Penida, Nusa Ceningan and Nusa Lembongan are three beautiful islands located off the East coast of Bali which have some stunningly beautiful dive sites around them. On the south of Nusa Penida lie the sites known as Manta Point and Manta Bay – you can probably guess what these are famous for!! The best known dive site in the area is probably Crystal Bay where during the months of July to November you have a high chance of seeing Mola Mola rising up from the deep to have their spa moment as they get cleaned by the local reef fish. Lembongan / Penida are undoubtedly the best places in the world to see Molas.